Q: Is it allowed to glue the beams? A: YES. Under the provisions of Gen. Class Rule 16.7 and provided it is not used to canter the hulls beyond the original angle, gluing of the beams to the beam anchor points shall be considered class legal. Q: Is it allowed to change the canting angle/camber of the hulls by adding material to the beam anchor points? A: In general NO. It violates the letter and intent of Gen. Class Rule 1 & 2. However, it may be acceptable, if it as part of a repair to the beam anchor points has been necessary in order to bring the angle back to the original angle. Q: Is an 8:1 mainsheet legal? A: NO. Gen. Class Rule 16.4 specifies 7:1 as max. Q: Is the use of double traveler cars allowed? A: YES. It is regarded as an insurance policy in the same way as carrying spare shackles etc. while racing. Q: Is it legal to race without the bottom batten in the main sail? A: NO. It violates the letter and intent of Gen. Class Rule 1 & 2. Q: May jib tracks be removed? Q: May the jib position be moved inward with use of a wire between hulls? Q: Is it allowed to drill extra spreader rake holes?A: NO. It violates the letter and intent of Gen. Class Rule 1 & 2. Q: May the mainsail clew reinforcements exceed the original area? A: In general NO. It violates the letter and intent of Gen. Class Rule 1 & 2. However, subject to approval of the class measurer, it may be acceptable, if it is the result of a repair of a torn sail in the clew area. Q: May the mast rotator be moved from its original position to the bottom of mast and be adjustable from the wire? A: NO. It violates the letter and intent of Gen. Class Rule 1 & 2 and is outside the provisions of Hobie 18 Rule 5.6. Hobie 18 Rule 5.6 is meant to give guidelines for potential additions to the original system supplied by HCC. Q: May the top of the centerboards be cut off? Q: Is it allowed to race with non Hobie Cat Co supplied trampolines? A: NO. Gen. Class Rule 16.5 applies. Q: Is it allowed to remove, resize or relocate the hull flotation blocks? A: NO. Gen. Class Rule 1 and 9.5 applies. Q: Are cleats allowed to control of rudder kick-up? 2. Must the shock cord be tied only? 3. Are other items (e.g. plumbing pipe rubber rings) allowed instead of shock cord? A: 1. NO. Gen. Class Rule 10.4 applies. 2. YES as specified in Gen. Class Rule 10.4. 3. NO, Gen. Class Rule 10.4 allows shock cord only. Q: Is it allowed to use wire for a jib clew pigtail? A: NO. Gen. Class Rule 16.2 applies. Q: Is it allowed to replace the Hobie Cat Co. supplied Harken swivel cleats on the mast for the sail downhaul with for example Ronstan fittings? A: YES. Any brand can be used if sticking to the prerequisites laid down in Hobie Cat 18 Rule 5.1. Q:What is the purpose of the “black band” mentioned in Hobie Cat 18 Rule 3? A: In the old days the “black band” was supposed to indicate max. allowed downhaul as well as it served as a safety label reminding about to watch out for low overhanging powerlines. Nowadays it serves as the latter only. 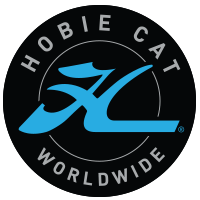 Q: Hobie Cat 18 Rule 5.7 mentions additional jib cleats. Is it required to still have the cleats on the hull as well and what purpose would additional cleats have? A: YES. Hobie Cat 18 Rule 5.7 is meant to give guidelines for potential additions to the original system supplied by HCC. Depending on the sailing style it could be about keeping the jib sheet better within reach of the crew on the wire. Q: What are the membership requirements when participating in races, where the Hobie Class Rules applies? A: Gen. Class Rule 26 outlines the requirements. I.e. at worlds and regionals all crew members shall be in good standing with the Hobie Class Association. At all other events at least one crew member shall be in good standing with the Hobie Class Association unless prescribed otherwise in the Notice of Race. Above compilation of questions is based in enquiries recently received from committed Hobie Cat 18 sailors from Australia. The Rules Committee has considered the questions and produced some answers, which can hopefully help to clarify the raised issues and matters.